I am so ready for springtime and gardening. I can’t wait to lose the winter doldrums and start planting. The seeds I started indoors are getting out of control. The scarlet emperor beans are a foot high. 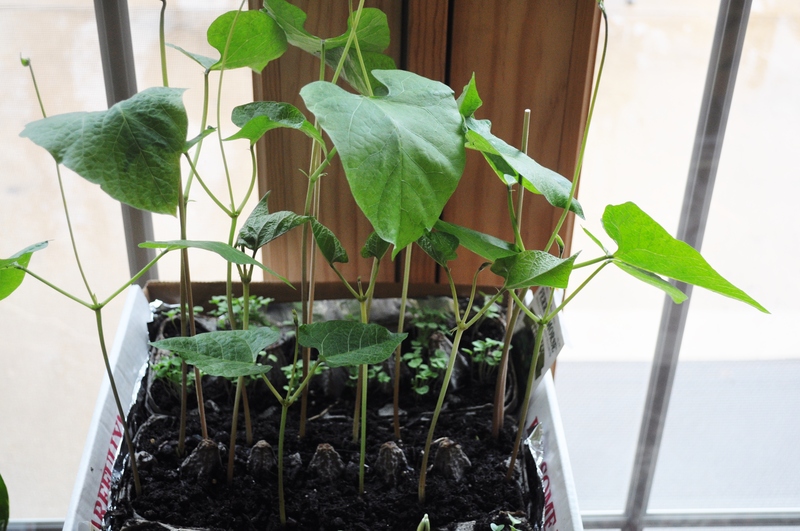 The edamame have pushed through the potting soil. Lots of arugula ready to transplant. The cardoons are getting feisty. Purple tomatillo. Check. I also started a small pot yesterday with dill seeds for the herb garden out back. 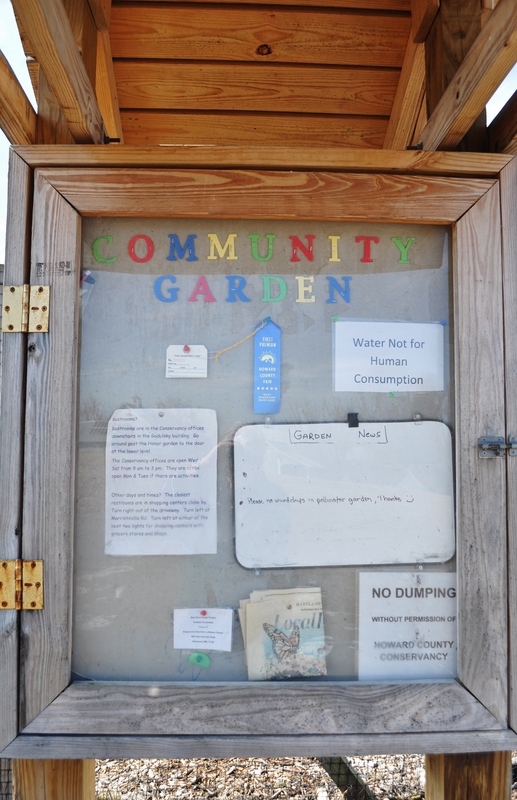 We had our kick off community garden meeting today. There are 24 new gardeners at the Conservancy plots. Next week. Row cover pick up. The following week. Garden work day. Next week, also is Greenfest at Howard Community College. The following week, is the coop to coop tour for the chicken coops in Howard County. Sometime in there I need to go pick up my plants for my summer garden from Sharp’s, and put the potatoes in the ground in the yard. We are deciding where to put the root plants. The hoops with row cover. Where to put the tomatoes and the peppers. Posted in Food, Gardening, Howard County, Nature, Weather and tagged Food, gardening, Howard County, howard county conservancy, real food, West HoCo. Bookmark the permalink. A week or so ago I got an email from Burpee saying they were shipping me something. 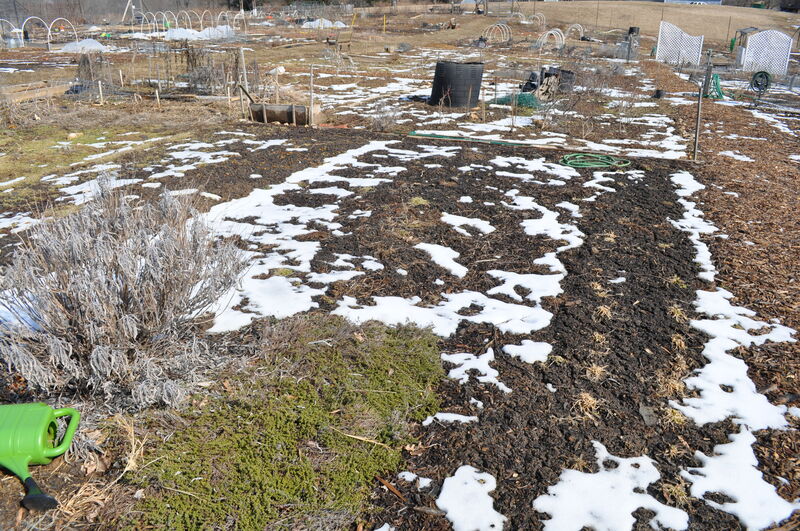 Since I only remembered ordering tomatoes and banana pepper plants I was thinking that someone got their zones mixed up–we just got snow yesterday! However, when the box arrived it was shallots, and I’ll stick them in the ground whenever it warms up enough to dig. My garlic bed has sprouted, and on a warm day 2 weeks ago I got busy layering shredded leaves and coffee grounds and kitchen scraps to rot in the beds that should get tomatoes–in another 6 weeks. That leaves keeping my fingers crossed that the perennial herbs survived this super cold winter . . . I love this time of year! It is snowing again here. How much? Who knows? At least my garlic is hanging in there.